We asked the experts how for their recommendations: from burgers to buddha bowls and beyond. THERE’S NEVER BEEN a better time to be a vegan. What was once regarded as a niche lifestyle choice has now been widely embraced with more people adopting a plant-based diet than ever before. With that has come a noticeable change in Dublin’s food landscape with cafés, restaurants and even chippers now offering vegan fare. 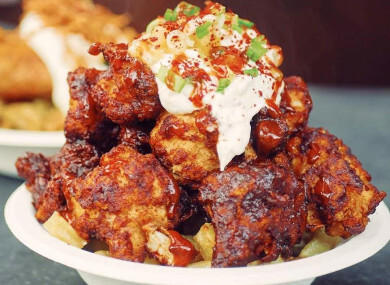 “When we were doing market research three years ago it was a real mixed bag of results,” says chef Mark Senn of Veginity, a restaurant specialising in plant-based street food. The trio behind Veghuns, an account dedicated to sampling vegan fare around Dublin, agree. Indeed the vegan food scene in Dublin is so vibrant that there is now a Vegan Dublin Food Tour. Run by Scott and Sivan Renwick, the co-founders of Vegan in Ireland, the tour is dedicated to showcasing some of the city’s most delicious vegan dishes. With that in mind, we decided to consult Evelyn, Kate and Linda of Veghuns; Scott and Sivan Renwick of Vegan in Ireland; and Mark Senn of Veginity for their top vegan dining recommendations in Dublin. Cornucopia isn’t just a restaurant – it’s an institution. Since 1986, it has been serving hearty vegetarian and vegan food to the masses. “Their food is simply spot-on, delicious, and always served in generous portions,” say Scott and Sivan Renwick. Get the garlic potato salad. Ever tried vegan pizza? Aperitivo has the largest selection of vegan pizzas in the city as well as a selection of assorted vegan sandwiches and snacks. We have it on good authority that their Vegan Meat Feast is to die for. Homemade chickpea burger with sweet red dried chilli peppers and delicious vegan mayo. McGuinness’ on Camden Street made waves a few years ago when it launched its vegan menu. Their mission was to become “the first chipper to cater to our vegan customers with their own menu”. Since then, they have been serving up vegan versions of traditional chipper grub. “Guests are always super impressed with their vegan nuggets and vegan battered sausage,” says Sivan Renwick of people on their Vegan Dublin Food Tour. Veghuns, meanwhile, describe the garlic cheese chips as “delicious”. Run by Hare Krishnas, Govinda’s has long been favoured by vegetarians and vegans in Dublin for their simple, healthy meals. For a little over a tenner, you can get a generous and sizeable meal filled to the brim with veggies, beans, lentils, rice and more. “Even the small plate is substantial,” say Veghuns. Buttercream Dream specialises in 100% vegan baked goods and regularly pops up all around the city. Think decadent, guilt-free treats. “Her stall is a real joy when we feel like pampering ourselves and others with delicious cakes, cupcakes, brownies and the various sweet indulgent treats she creates,” says Sivan Renwick. This healthy café only opened a few months ago, but is fast becoming a favorite haunt of vegans in the city. Pies, salads, a vegan full Irish breakfast – it’s all there. The real star of the show, though? “They serve a mouthwatering oyster mushroom burger, which we think is the best vegan burger in town,” says Sivan Renwick. A fixture at Eatyard for the past few months, Kale + Coco have won tons of fans for their colourful smoothie bowls and nourishing buddha bowls. According to Sivan Renwick, their food “delights the senses”. High praise, indeed. Kale + Coco’s stint at Eatyard may be wrapping up this weekend, but keep an eye on social media to see where they’ll pop up next. While salads may be their bread and butter, there’s a whole lot more to Blazing Salads than meets the eye. Beyond their renowned salads, you can also gorge yourself on their soups, hot specials and small bites. “We stop here at least once a week for their salad buffet but end up getting so many more savoury and sweet treats like their vegan samosas and their caramel bites,” says Sivan Renwick. Thanks to Vegan in Ireland, Veghuns, and Mark Senn of Veginity for their insights and recommendations. Email “An insider guide to the most delicious vegan food in Dublin - from burgers to buddha bowls”. Feedback on “An insider guide to the most delicious vegan food in Dublin - from burgers to buddha bowls”.